This is 2 coats of Essie Mesmerize, a bright royal blue (which is darker, brighter, and not nearly as dusty as my picture would suggest), with 2 coats of Barielle Starchild on my tips. Yes, y'all... I am still addicted to the glitter tips. LOL. 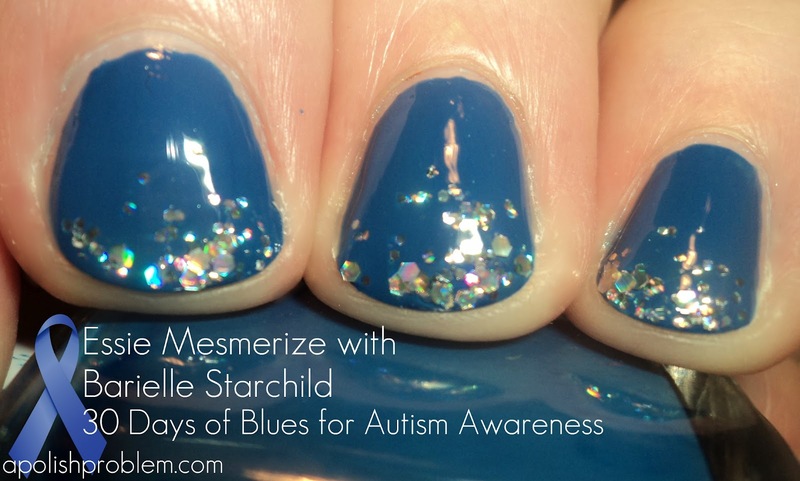 Essie Mesmerize is easily one of my favorite blues in my collection, and it was one of the earliest blues I purchased. I remember when it came out, I had recently started becoming interested in polish again, and I had just discovered nail blogs. When I saw this one on The Polish Addict, I immediately fell in love. However, I had yet to become comfortable with the idea of wearing blue on my nails. Once I realized that I can wear anything and everything on my nails ("p'shaw Mom, red isn't natural either". LOL), I quickly added Mesmerize to my collection. Also, unlike a lot of other older Essies made of win, Mesmerize is still in the regular line-up, so it should be easy to acquire if you have a lemming. And because it was sitting right next to me looking all shiny, I then added 2 coats of Barielle Starchild just to my tips. Starchild was one of the polishes that I purchased, along with Shannon's Attitude and a couple others, when Barielle offered their 30% off sale a few weeks ago. Also, like Shannon's Attitude, this one looks nothing like the picture on Barielle's site (this is becoming a trend). Based on that picture, I thought it was going to be blue and silver glitter in a clear base. It's not. It's still beautiful, but again, keep in mind, it's not like the picture. Rather than being silver and blue glitter, it's actually highly rainbow-holographic, multi-shaped and sized, chunky glitter in a clear base. When I first pulled it out of the box, I was disappointed, but just like with Shannon's Attitude, I was very pleasantly surprised. This picture does not do it justice. Trust me, it's crazy, I-may-wreck-my-car shiny. I have several chunky, holo, glitter top coats and this one just blows them out of the water. Again, thank you so much for reading my "30 Days of Blues" posts. Remember, I'm glad to take any requests for blues. I have a huge amount of blues, so chances are I may have it (just don't say Starry, Starry Night). Please reply to this post with any suggestions, or you email them to megan@apolishproblem.com. I like the blue color, it's so deeply blue! I love Mesmerize! It was the 2nd Essie I bought!